Dr. Sanjay Jatana discusses new advances in neck surgery, including the artificial disc, that enable patients to recover from pain symptoms, and lessen risk of future problems. Dr. Sanjay Jatana is a board-certified, Denver orthopedic spine surgeon who balances surgical and non-surgical approaches when treating patients with neck pain. In some cases, spine surgery may not be the answer to your problem or the results expected from surgery may not justify the risk. 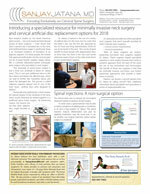 The good news is that there are many ways to address spine problems. Neck pain can take a toll on your quality of life and leave you feeling hopeless. Dr. Sanjay Jatana provides options to help patients overcome their spine problems and resume their active lifestyles. We know that choosing an orthopedic spine surgeon can be challenging. When you visit our office, Dr. Jatana’s and his staff will evaluate your neck issues, discuss your expectations and answer all your questions. We want to make sure you have a good understanding of your condition, so the treatment options and the ramifications of those options make sense. Dr. Sanjay Jatana is partner physician in Denver Spine Surgeons, a spine specialty center within Orthopaedic Centers of Colorado, one of the largest orthopedic groups in the State of Colorado. If you have neck pain you are not alone. It’s estimated that each year, one in three people experience some type of neck pain. 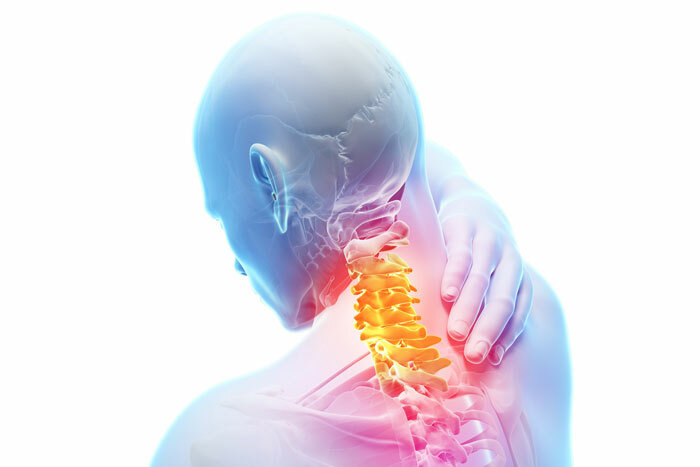 Whlle many of these cases can be simple neck strain that can resolve over time with spine therapy and other non-surgical treatment options like spinal injections, there are many serious neck pain issues, including herniated discs, stenosis and fractures that require surgery to relieve symptoms. Degenerative disc disease is a weakening of one or more vertebral discs, which normally act as a cushion between the vertebrae. Discs can degenerate as a natural part of the aging process, but may also result from injury. A herniated disc occurs when the soft, jelly-like material from inside the disc (nucleus) protrudes outside and through the outer ring (annulus) and compresses the spinal cord and nerve roots. A herniated disc can arise through the wear and tear of aging or from minor injury to the spine. This is a SERIOUS emergency symptom (cauda equina) that needs to be treated immediately by a spine surgeon within 24 hours. If you experience these symptoms at night or on the weekend, go to the emergency room. If not treated quickly, the person may lose control over their bowel and bladder permanently. Call our office at (303) 697-7463 or request an appointment. Numbness or weakness in an arm or leg could imply a SERIOUS disc-related symptom that is NOT appropriate for watchful waiting. Left untreated, the symptom can become permanent. You should see a spine specialist within 2 days. If pain, weakness or numbness extends into the foot so that you are unable to lift your toe as you walk, that is called Foot Drop, which is an emergency disc-related symptom. You need a spine specialist within 2 days. If not treated promptly, it could lead to permanent weakness in the foot. Pain that radiates into an arm below the elbow can imply a herniated disc in the neck, while pain that radiates into a leg below the knee can imply a herniated disc in the low back. Many times radiating pain can be treated non-surgically. To be safe, radiating pain should be seen by a spine specialist within 2 days. Pain that is limited to the neck (without trauma) may be the result of muscle strain. See our Home Remedies section on our Internet site. If pain persists beyond a week, you should see a spine specialist to determine the underlying cause. Pain that is limited to the low back (without trauma) may be the result of muscle strain. While pain spasms can be excruciating, muscle strain problems do not require surgery. See our Home Remedies section on our Internet site for special stretches that can relieve pain, and the proper use of anti-inflammatories. While less common, a kidney injection or kidney stone may also cause low back pain symptoms. Consequently, you should consult a spine specialist accordingly for symptoms that persist beyond 5 days to determine the cause of your symptoms and the best treatment options, including a customized home exercise program that will make the back stronger, more flexible and resistant to future strain. Any time you fall, are in a car accident, or could have fractured a bone in your back, you should see a spine specialist immediately! Other symptoms may be unrelated to a back or neck problem, like cervical meningitis. This can be serious. You should consult a physician immediately for any of the above symptoms. * Those who self diagnose and self treat themselves do so at their own risk. We accept no responsibility for any problems that may result from the use or misuse of educational information intended to be helpful guidance. Like anything else in life, practice makes perfect, and those physicians who specialize in a specific niche — like focusing only on neck surgery and nothing else — will tend to become more proficient than another surgeon who treats the entire spine along with brain tumors. Simply put, the neck specialist will likely do twice as many neck surgeries in a given year than another generalist spine surgeon who does both low back surgery and neck surgery. Dr. Sanjay Jatana only treats neck problems, and only performs neck surgery. He has elected to specialize in cervical spine surgery, and refers low back cases to his three partners at Denver Spine Surgeons. In addition to being board-certified in orthopedic surgery, Dr. Jatana is fellowship-trained. Fellowship training is the highest level of medical education possible in the United States. Dr. Jatana is one of the few neck surgeons in the Rocky Mountain region able to perform microsurgical procedures that eliminate the need for a neck fusion. Other motion preservation surgeries like artificial disc replacement make our practice a regional referral destination for neck surgery. Web Design & Educational Content © Copyright Prizm Development • Developing Centers of Excellence for Better Healthcare.